We here at AFFotD have a hard time shutting up about pizza, probably because it’s delicious and incredible and if you don’t like pizza you’re a bad person and you should feel bad. However, in our rush to point out things like “Pizza with toppings put in the crust” or “Goddamn it Japan you’re doing it wrong” we’ve overlooked one of the most important aspects of pizza’s culinary life—its European beginnings, and America’s impressive ability to adapt it for its own heart-clogging purposes. Pizza as a dish originated in Naples, Italy, much more recently than you would assume—while variations of bread baked with cheese have been around since the ancient Greeks, and Italians were eating some combination of baked bread, cheese, and tomato called “pizza” since the 17th century, the “modern” pizza likely wasn’t invented until 1889, using red tomato, green basil, and white mozzarella so as to cover the pie in the three colors of the Italian flag. It’s basically the same logic that America applied when inventing red, white, and blue jello shots. 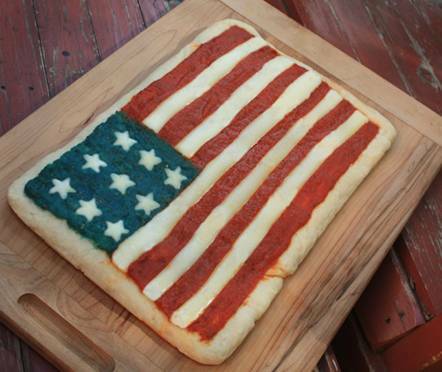 Despite being such a famously “Italian” food staple, America wasn’t particularly far behind the curve in the pizza department. The first American pizza establishment opened up in the Little Italy neighborhood of New York by 1905. Once pizza reached our shores, we went to work on perfecting it, and we’ve since gone on to develop countless regional forms of the dish, some of them barely resembling the original Italian creation. Usually that’s for the best. Sometimes, not so much. But we are a land of experimentation, and we’re here to embrace that quality, so join us for the first part of a two part pizza spectacular where we show you the best and worst of America’s regional pizzas, starting with the best because we know you’re hungry right now and we do so love to torture you.